A hodgepodge of my fruit adventures. In California and over seas. I love sharing my Fruit Hunting adventures with my friends and family and my new readers as The Fruit Hunter. You will notice, I’m sure, that this article is now somewhat outdated, seasonally speaking. What with the Holidays and just the general business of life, this piece slipped away from me. What started in December is now being posted in February… These things happen. So what I ask of you as you read this article is this: take yourself back to the beginning of winter, just as autumn slipped away. Read at night or early morning, curled up with a hot cup of tea and a warm buttered scone…. Enjoy! This year as summer and its bounty of fruit slipped away, cooler nights requiring thicker bedding, the glossy green leaves on our persimmons started to turn. As the nights passed and the first of the season's storms blew through, the yellow, red and rust leaves fell away leaving only the perfect orange orbs hanging from the bare branches. Many of us know there are two types of persimmon, astringent and non-astringent and their two most well known varieties - Hachiya and Fuyu. Both are regularly found in most grocery stores this time of year (early autumn to beginning of winter). As I harvested fruit from my trees of both variety, I found myself wondering if there were others...there must be. This started me on a new research project! For those readers unfamiliar with the two main commercial varieties, the Fuyu is the flatter, crunchy type that can be eaten like an apple, the Hachiya is the oblong astringent variety that must be ripened to softness to be eaten. The answer to my research is a resounding YES, there are many other varieties. In fact there are over 2,000 other Asian varieties of Diospyros kaki! Native to Japan, China, Burma, and Nepal they have been cultivated for centuries in these countries. It wasn’t until 1854 when Commodore Matthew Perry of the US Navy ‘opened’ Japan to the West, that seeds brought from Japan made it to California. By 1930, California had over 98,000 bearing trees on over 3,000 acres, but real estate developments reduced persimmon groves to only 540 acres by 1968. Persimmon trees are very easy to grow, being nearly pest and disease resistant, frost (to zero degrees) and drought tolerant especially once established. They do not require winter chilling and will even grow in subtropical and temperate climates. To top it all off, they are quite picturesque. With large lush drooping leaves, persimmons look almost tropical in the Spring and Summer. Later they turn to bright yellow, orange and reds in the fall. They are long lived trees, a six-hundred-year-old grafted ‘Saijo’ tree is still growing in Japan. Prune your tree when dormant, making sure to create a sturdy framework when young to prevent brittle branches from breaking later with a heavy crop. Remember, flowering and the subsequent fruit sets on one-year-old wood, so make sure not to cut this all off when pruning. They have lovely, extremely inconspicuous flowers in the spring: the single female flowers are cream colored connected to a green calyx, the male flowers have a slight pink tinge and often come in threes. They both bloom on one-year-old wood. Persimmon trees are usually male or female but some trees have both flowers. The tree can also alternate from year to year! In regards to the fruit, when talking with friends and family, I hear time and again that they either love or hate it. Most people could try the non-astringent Fuyu and probably love it. They are crisp and sweet with a crunchy skin, eaten like an apple, but to experience a truly ripe fruit of the astringent variety can be a transcendent experience. The fruit when ripe has a translucent skin, so delicate it’s likely to split before you can get it to your mouth. (Use a spoon!) The flesh has a smooth, jelly-like texture with five clear lobes with a slightly firmer consistency. They are sweet with an earthy, honeyed note. Persimmons are often the size and shape of tomatoes with colors ranging from pale yellow through orange, to crimson and deep red. In some cultivars, ripe fruits are so soft, they are almost liquid. There are a few ways to ripen the fruit artificially, but the fruit needs to be near to ripeness on the tree. Fruit will also ripen completely if left on the kitchen counter. The easiest way to ripen a persimmon is to put it in a plastic bag with an apple. It will be ready for eating in three to four days. They can also be frozen and then thawed, when they would be perfect for baking in a pudding, cake, or bread. After reading about hundreds of varieties, I’ve distilled all the info to recommend a few to you, my dear readers. ‘Hachiya’ - Major market persimmon, rated one of the best in the world. Large, oblong-conical fruit. Glossy skin, deep orange. Excellent honey-sweet flesh with notes of raisins and brown sugar. When fully ripe, the skin will be thin, ready to burst, feeling like a water balloon in hand, flesh will be clear and jelly-like. Great for drying. Midseason to late. Tree is vigorous, doing very well in California. ‘Eureka’ - Medium-large, bright orange to deep red, does not need pollination, late harvest, of excellent quality. ‘Honan Red’ - Small, round, thin skinned fruit, deep red, heavy producers. Very sweet and rich flavor, fruit is smooth and fiber free. Excellent for eating and drying. Ripens midseason to late. 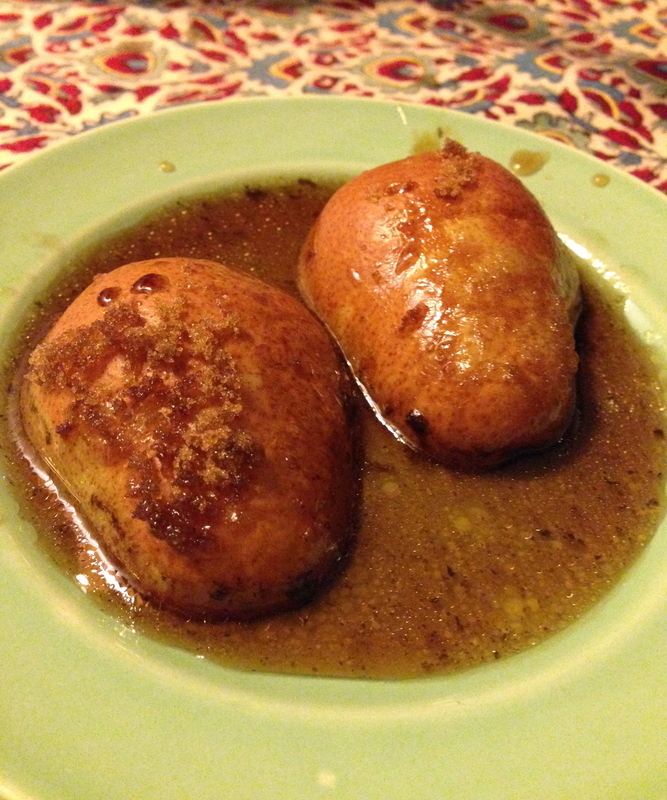 ‘Saijo’ - Small, plum shaped balls of honey. Yellow-orange flesh, very sweet flavor, ranked one of the best by gourmets. Free of seeds and a constant bearer. One of the first persimmons to ripen, starting in September. ‘Fuyu’ - Leading market persimmon, large with reddish-orange skin. Flat bottomed, slightly four-sided. Ripe fruit offers an excellent spicy-sweet tannin-free flavor, some say cantaloupe- like. Flesh is a lighter, pale orange. Fruit packs and ships well. Heavy producer. Ripens late, fruit can stay on the tree for up to two months. Most popular cultivar in Japan. ‘Jiro’ - Glossy tangerine-hued, medium sized, flat and squat. Jiro is a very attractive tree, growing to about 15 ft. Self-fertile, hardy to USDA zones 7 to 10. Jiro ripens one to two weeks before Fuyu and can be sold as Fuyu. ‘Tsurunko’ ‘Tsuru Noko’ or ‘Chocolate Persimmon’ - Medium to small fruit, orange-red skin over flesh the color of brown sugar and cocoa. The flavor reflects the color with notes of cocoa, sweet baking spices and honey. 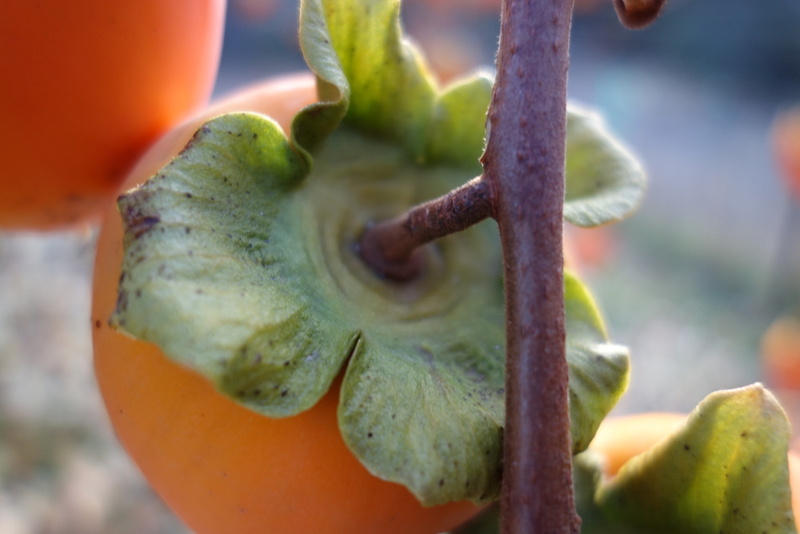 A unique persimmon, non astringent when pollinated, the seeds change the flesh chocolate brown, when unpollinated, and seedless the flesh stays orange and astringent. Ripens late October to early November. ‘Hyakume’ - Known as the sweetest persimmon of all. Medium to large roundish fruit. Buff yellow orange skin and dark cinnamon speckled flesh. Flavor is sweet with notes of cinnamon, brown sugar and dried apples. Texture varies from crisp and succulent when young to soft and custard-like as it ripens. This fruit can be somewhat unattractive externally, but the flavor more than makes up for it. They also store well. Ripens mid season. Well there you have it, just a tiny portion of the incredible selection available to all of us. What choices! With all the research and wanting to shop locally (Sonoma County, CA) I ended up choosing the astringent ‘Saijo’. I bought it at our local nursery Harmony Farms as a bare root tree, and planted it the next day. In a few years, we’ll have an avenue of persimmon trees to drive through as you reach our house. I can’t think of anything more beautiful. Ah, it's Spring! This is a particularly gorgeous season here in Sonoma County since we have a rather long, hot, dry season usually from June through October or November. Right now the hills, trees, bushes, and vines are a wild emerald green, absolutely bursting with life! For many or most in the Western world, an apple means a Fuji, Red and Golden Delicious, Granny Smith, or if a shop is feeling a bit adventurous. a Gala or Pink Lady. I grew up knowing none of these. I learned my apples by when they ripened and which trees I could climb. Our first to ripen is the Duchess of Oldenburg; a small unexceptional apple that quickly went from crisp to mealy mush (not a family favorite as I’m sure you gather, and in fact we took it out this year and replaced it with a Doyenné Du Comice pear). Next, the famous Gravenstein (from Denmark originally in the late 1790’s), our semi dwarf producing enough apples to feed a small army, but all coming in within one month, making it impossible to do much but make a flurry of pies, eat until we can’t imagine eating another apple, ever, and throwing the rest to our chickens. It’s mid-November now and the apple season is coming to a close, but some of my favorite varieties have been hanging, ready, dew drop covered for an early morning pick. Growing up in our orchard, I took it all for granted so when I thought of writing this article, I realized I knew next to nothing of the varieties that we grow. Time to research (one of my favorite things to do, along with making lists)! First on my list: Malus domestica ‘Rome Beauty’ the apple I always thought of as the Snow White apple: a large, round to slightly oblong, shiny, deep red skinned apple with impossibly white flesh, a fine delicate taste with a distinctly lemony tang finish. Not too sweet, very rarely mealy and not very juicy, it’s sometimes not considered a great eating apple, but it’s for these reasons I love it so. The Rome Beauty is known as one of the best apples for baking as its flavors come out when cooked and is able to retain its shape and consistency, making them especially great for whole baked apples. It’s also a good apple to store for some time after picking. Originally called ‘Gillett’s Seedling’, the first history of the Rome Beauty was noted in 1817 when Joel Gillett got the tree in a shipment of apple seedlings for his property in Ohio. Noticing that it was a different variety from the rest, Joel gave the tree to his 14-year-old son, who planted it on the banks of the Ohio river. Years later, Joel’s cousin Horatio Gillett noticed a shoot coming from below the graft line (usually pruned and discarded) producing large, red, shinny apples. He started taking cuttings of the tree and selling them as ‘Gillett’s Seedling’ in the small nursery he opened. The original apple tree itself was renamed in 1832 in honor of the town, Rome Township, and lived until the 1850’s when it fell into the river due to erosion. Grown in many parts of California because of it’s low chill requirements and resistance to certain diseases, with a later bloom, makes it a great tree if you’re in an area with late frosts. It is also a self-pollinator. In our orchard it starts harvesting in September, goes through October and well into November. These days it can be found in some markets and definitely at a farmers market under the names Rome, Rome Beauty or Red Rome. My second apple the Winesap, is an old American heirloom, parent to a variety of strains including the Arkansas Black and the Stayman Winesap. The history of the Winesap is murky, some accounts saying it dates back to the 1700’s (or before), but more is known about this variety starting in the mid 1800’s, others saying there is little if nothing known before 1917 where it was found in New Jersey. Some say the Winesap and the Stayman Winesap are one and the same, named for the developer Joseph Stayman in 1866, while others say the Stayman Winesap is a descendent of the original Winesap. Also a late bloomer and fruiter, the Winesap is one of not too many apples that has pink to red blossoms instead of white. The fruit, starting to ripen mid September and continuing through the end of October, is a round, medium orb with a green under color covered in pink to red striping. Some of our apples have a bit of russet on the base and top. The flesh is a lovely creamy pale yellow, dense and very juicy, tart with a distinct spicy note, which helped give its name. It is not a self-pollinator, so you’ll need one of the recommended pollinating varieties such as Red or Golden Delicious, Fuji, Gala or Liberty. An excellent storage apple, great for baking, canning, cider and especially eating fresh, the Winesap has the most distinctly ‘old fashioned’ flavor. The tree is a slow glower, staying smaller than most if it’s neighbors, with a lovely easy to prune shape. Not one to send out thousands of water shoots, but quick to cover itself with fruiting spurs. Third and maybe the most well known is the Arkansas Black, thought to be a seedling of the Winesap. Ironically, this apple is in fact known as the Snow White apple (not the Rome Beauty). Again, there are two versions of its history. The first is that a man named Earl Holt, a son of an early settler in Arkansas owned the first commercial nursery and it was his brother De Kalb Holt who originated the Arkansas Black. The second, according to The Encyclopedia of Arkansas History and Culture is that the Arkansas Black was first produced in the orchard of a Mr. Brathwaite. Either way it was a main constituent of the commercial apple industry of the time. By 1907 there were over 4,000,000 apple trees in just two counties within Arkansas. In 1919 Arkansas produced over 5.5 million bushels of apples. Apples were booming and continued to, until 1920 when the codling moth infestation paired with stricter FDA regulations (due to the spraying for the codling moth) made growing apples more expensive, then a drought of several years strained the apple economy to the point of breaking, but it was the Depression of the 1930’s that finalized that downfall of the industry. The apple economy never recovered. Today the Arkansas Black makes up 3% - 5% of the state’s total apple crop. The fruit itself got its name from the wonderfully deep dark red color sometimes verging on black. A medium sized, round fruit with slightly tougher waxy skin yields to dense, fine-grained creamy yellow, wonderfully aromatic, juicy flesh. The stem cavity is on the smaller side, and sometimes russeted. They are known to keep for a solid 3 months or longer when kept in a very cool dark well-ventilated area, without getting mealy. The longer they sit, the darker their skin gets until full red/black and the flavor mellows, losing some of their tartness, going towards a sweeter finish with hints of nutmeg. A versatile apple, to be used in pies, canned, sauced, eaten fresh, juiced, made into hard ciders, or as Chef Diep Tran from LA Weekly suggests, treated like a Southeast Asian fruit: cover a slice with salt and Thai chili. How fortunate I am to have grown up with these exceptional heirlooms. Each season I take a bite of apple that’s a part of our history, as a country and a people. In a matter of one week, we’ve gone from summer ending, to full autumn. I know it’s here when I can smell it. 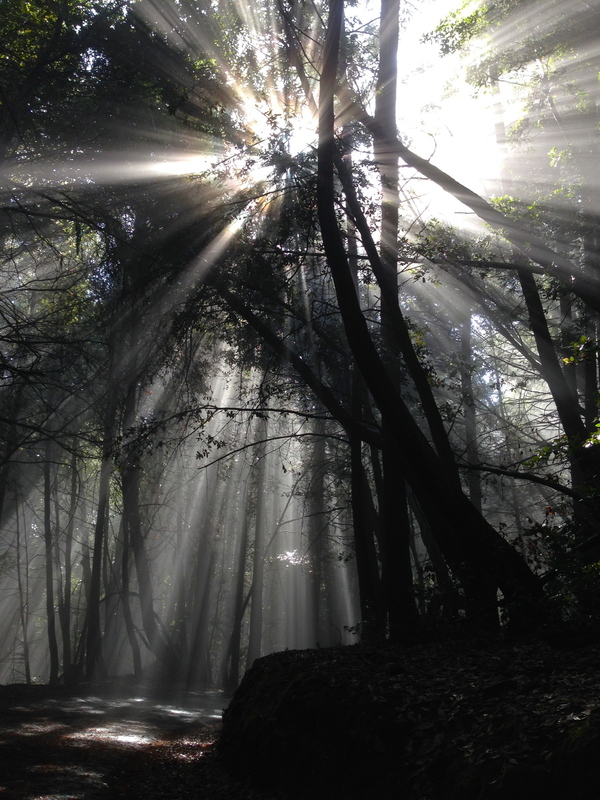 Of course the 1”- 2” of rain we had here in Sonoma County a few days ago helped to give the seasonal nudge. Last Sunday morning, a warm breeze scattered a delicate golden layer of Honey Locust–Gleditsia triacanthos leaves around my feet as I stood in my back yard, picking a basket of Conadria figs-Ficus carica conadria in preparation for a Birthday celebration for Jess. The oak trees had a hint of rust and bronze, but otherwise it looked & smelled like summer. That afternoon Tim, Jess & I took Winston & Stella (the hounds) on a walk up the road to pick perfectly ripe Bartlett pears for dessert. It was still warm enough to walk in shorts and flip-flops. That night as we ate and drank to Jess, we all acknowledged the end of summer, and our excitement to welcome the beginning of fall. Sleeping in, warm clothes, fireside rainy days, and hot toddies, making soup, movie days, reading and the holidays! Our incredible Harvest menu: A fall-apart pot roast http://ow.ly/BJ0OS from beef harvested just one ridge over at Flying W Ranch http://ow.ly/BJ0UD, Blue Lake green beans picked that day from my garden with homemade pesto made by my friends Ollie & Kiera, Rosemary & olive oil roasted golden potatoes, fresh salad, and of course the figs! Fresh grilled figs on Rosemary skewers with a lemon honey glaze. The smell of wet moss and Douglas fir remind me of the holidays, and friends & family I’ve lost. But for the night, I am supremely happy. Surrounded by friends so dear they are my family. I will make comfort foods, dry more figs, can a batch of spiced fig chutney and a batch of ginger pears in simple syrup and enjoy the wonderful, wonderful rain. Sign up with your email address to receive my Fruit Hunter news and updates. One of my favorite places in Sonoma County to Fruit Hunt as if I’m abroad, is the little market on Petaluma Hill Rd. The very plain, not-to-inviting storefront, but you've heard 'Don't judge a book by it's cover'. Very applicable here. The not so specifically named ‘Asian Market’ http://ow.ly/Aqnfa, owned by jolly Laotian native Charlie, is my go-to for the hard-to-find Asian products like Crispy Prawn Chili, Tamarind Paste, or Pickled Thai Eggplants. Thai Eggplant, adds excellent texture in any dish. Always welcoming and tickled to see me, a naive young gringa sifting through the produce of his homeland, Charlie’s always happy to give a cooking tip on some of the more obscure vegetables, or advise me not to eat the peel of a fruit I’m about to plunge into, but to cut off the end and extract. Jujube, an apple-like fruit. Chrunchy, chrisp, no too much flavor in the ones I've tried. He and his family bring in seasonal fruit in short but sweet windows throughout the year. Check frequently, and one may find the treasure of a whole, wonderfully stinky Durian, Dragon Fruit, a cluster of Longan, a bag of Rambutan, or my particular favorite, Lychee. During my last Fruit Hunt a couple days ago, I was lucky enough to get a few pounds of Lychee (some of the best of this year!) and a few banana/plantains (not sure which these are closer too). Some variety of Asian hot chili. Big, round, and ever so fragrant, I brought one bag of Lychee to work and introduced them to my co-workers, some of whom had only tried them canned. I thrilled to see the hook sink in as a look of pure pleasure settled on their faces, realizing what a treat a fresh, perfectly ripe Lychee is. With a smaller community of Asian Americans than in San Francisco just south, I’m thrilled to find any and all Asian products and produce in Sonoma County and will report back accordingly. Sign up with your email address to receive The Fruit Hunter news and updates. 2007. My very first travel/fruit hunt with my best friend Jessica Shepard. Young and reckless we took the red eye out of LAX to San Jose, Costa Rica. Not knowing what we'd find, not even having our first night booked we threw ourselves at the mercy of Pura Vida knowing we come out with our heads above water. True to form, we did just that. Ah the blind trust & self confidence of a 19 and 20 year old. We spent 6 weeks traveling the country, seeing the sights any traveler to Costa Rica must; Volcán Arenal, Monteverde Cloud Forest, Playa Grande, the Central Valley.. but the true gem we found was a sleepy little town on the Caribbean side of the country just South of Puerto Limón, Cahuita. So laid back, with the distinct creole & Rastafarian influence from nearby Haiti and Jamaica, we found the people to be the most welcoming, the price for living just right and the diversity of food thrilling. Fresh fruit grew wild at every street corner, as the jungle, growing ever thicker threatened to consume all. Cahuita National Park, just feet from many of our cabinas was where we spent more of our days. Hiking and biking (beach cruisers) through the dense undergrowth, watching a lazy sloth hammock itself in the limbs, plucking at every plant we saw, being chased by packs of Capuchin monkey's, and of course finding fruit. We tried Noni for the first time (I still find the taste and especially the smell far more repulsive than Durian), found & enjoyed what we were told were Jobos, had a Jackfruit curry, so many different varieties of Banana, Mango and Melon, to call each of these fruit by just that name in our supermarkets is a disgrace, and why do we insist on importing the most boring of flavors?! Our most exciting hunt involved a little bout of trespassing. We found a Cocoa tree - our very first encounter - and decided we simply must get one and dissect. Jess being the much taller of the two of us was elected picker. I documented the adventure and kept the lookout as she climbed over barbed wire, jumped to reach a twig, then proceeded to hack at the stem with a rock until we had our treasure. Back at the safely of our room, once open we had no idea what to do with it. We knew fermentation and drying of the beans was involved at some point..but with out those one can't eat it right? So with a rather anticlimactic end to our crime streak, we left it for the aunts. If we took one clue from them we would have seen they went absolutely crazy for the thin, creamy white membrane that held in each cocoa bean. Years later I learned that that is the choice part of a fresh cocoa pod and have eaten many since. Like custard. I will always think of this trip with the fondest memories, memories with the power to make me bust out like a hysterical cackling hen, in public, with no Jess around to make me look like a normal young woman having a laugh...but what of it. It's these experiences that shape us, that ignite a thirst to discover more fruit, to travel more, to see the world. Sign up to receive The Fruit Hunter news and updates.